Successfully Added Portable SATA 2.5 HDD Multimedia Enclosure to your Shopping Cart. 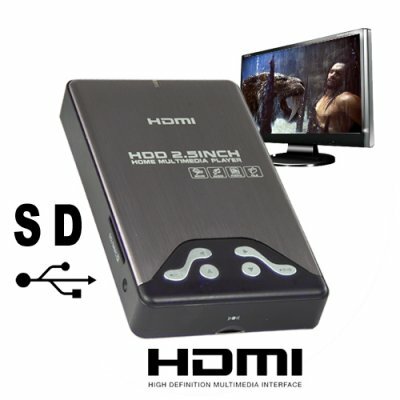 Portable SATA 2.5 HDD multimedia enclosure that comes with an HDMI connection for your TV. This is an outstanding multimedia player, once you switch it ON, you will instantly be able to select either the USB, SD or HDD option and start selecting what you want to watch or listen to. Insert your HDD drive and load it up with thousands of music, video, photos and movie files. Get this! when using this portable HDD media player with your computer or laptop, you only need to connect the USB cable, and it will power up through your computer's USB port. It has never been easier to use an HDD multimedia player, this slim pocket sized HDD enclosure will make a great upgrade to your home entertainment or theater system. Thanks to its pocket sized design which give's it the advantage to go with any decor style living room or media room. Whether you want to enjoy high-definition television, an LCD monitor, or a regular TV, this media player is built to be-friend them all! With ports for USB and SD/MMC memory cards, loading new media is quick and easy. So just pick up the remote, sit back and simply enjoy. The CVHQ-E24 enables you to enjoy all your favorite media videos, movies, music and photos on your TV, LCD monitor, high-definition screen, or home-theater projector. With powerful functionality, a user- friendly interface and an attractive durable design, this high- def multimedia player is perfect for anyone with a large collection of media files. This hot new item is now in stock and available for single or bulk purchases. The CVHQ-E24 is also makes a great product for single/company use or resale market, and is available to you straight from the leader in factory direct wholesale electronic products, Chinavasion. Do I have to format a hard drive before I can use it in this device? Your hard drive must be in FAT32 or NTFS format to use with this device. How do I load my media files onto this high-def multimedia player? Just connect it to a computer with the included USB cable. You can drag and drop your files onto the hard drive. How do I connect this device to a monitor or a TV? To connect to a monitor, use either the RCA, or HDMI cables, depending on the monitor or TV you are connecting to. How do I navigate through my files? The remote control and the simple menus make navigation easy. On your remote control, press "Movie" to watch your movies. Press "Music" to listen to your music. And press "Photo" to view your photos. You can also press "File" to browse through all your files. Does the device support the Greek language and does it display Cyrillic characters? The device does not support the Greek language and it does not display Cyrillic characters.